Over the bank holiday weekend our team were over at the lovely Quorn Grange Hotel for an order for our furniture hire. The lucky couple, Josh & Kim originally contacted as when they were recommended by Bespoke Weddings. 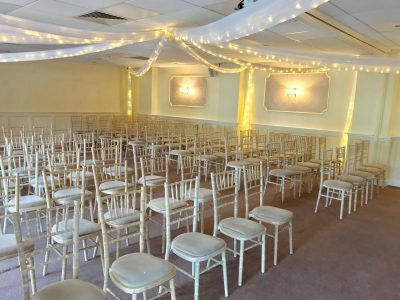 Searching for a suitable seating option for their big day we provided them with a whole range of different ideas from our furniture hire range. In the end a decision was made, and the bride and groom to be opted for our limewash chiavari chairs. 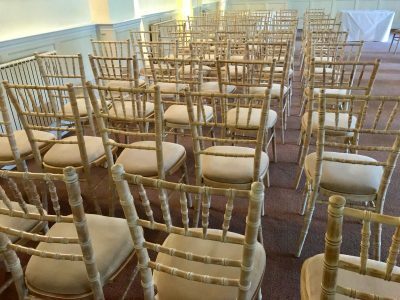 The delivery and installation of the chiavari chairs was very straight forward and simple on Good Friday. The chairs were set up in the Goodacre Suite by our events team on the day and they truly did look stunning underneath the starlit ceiling draping. Like everything we do here at Solid State UK we deliver a very personal service when it comes to our furniture hire. From our Leicester based warehouse we can deliver, install and collect our furniture at a time that suits you. Whether that be first thing on Sunday morning or the last thing Saturday night we are happy to work around your requirements. About to start an event like Quorn Grange Hotel Wedding?